With February being the month of love and Valentine’s Day fast approaching, I thought I’d take a moment to talk about the two greatest loves of my life – my wife Ashley and son Jaxson. My first date with Ashley nearly six and a half years ago seemed like it might be a dud at first. We met for a casual dinner at Old Chicago. We’re both quiet by nature, but the date seemed a little too quiet as I struggled to make conversation. I feared that any interest Ashley may have had in me was quickly waning. My mind started to drift to thoughts of how I could end the date early and what would I go do afterward. But then, we decided to take a drive together through Garden of the Gods. As I drove my sweet PT Cruiser (man, I miss that car), our hands found one another, and I felt a spark. We parked for a few minutes and start chatting under the stars. That feeling of being comfortable with one another and feeling like you’ve known each other for longer seemed to come over both of us. The night ended with a perfect kiss, and a few years later we were married. Because of Ashley, not only did I find my best friend for life, but I was blessed with a son – Jaxson. I’m living out all the little fatherhood daydreams I used to have, and I couldn’t be more grateful. Ashley and Jaxson inspire me. Having them in my life motivates me to do everything to the fullest. We’re a family of musicians and artists. Ashley is excelling in her work as a tattoo artist, and I’m always in awe of her creations. Jaxson has inherited his mom’s art skills and his drawings are way beyond his age. The three of us are all musicians. Ashley plays a little tenor sax and sings. Jaxson is already excelling on drums, sings and is about to take up the electric guitar. Meanwhile, I try to stay busy with a few bands playing drums, electric guitar and doing a little growling in metal bands. Recently, for my latest project I asked Ashley to sing on a song. She joined me on stage for the first time back in December. I know the experience was scary and nerve-wracking for her. But I was so proud of her. It was one of the highlights of my performing career having the love of my life on stage next to me. Heavy metal has become a family affair, as Jaxson has joined me on stage, twice, to provide some backing vocals on a tune. He shows a little stage fright but belts out his parts with assertiveness. Seeing that nearly brought a tear to my eye. Besides being an extremely gorgeous blonde, Ashley is my dream girl in all the ways. She loyally goes to nearly every show I play, she enjoys attending heavy metal shows with me, we both love watching “Ghost Adventures” and Netflix together, she’s the greatest cuddler and, an added bonus is, she shares my love for Mexican food. She has the biggest and kindest heart of anyone I’ve ever met. Jaxson’s a very kind and caring soul. Throughout any given day, he walks up to me a handful of times a day and just tells me he loves me and gives me a hug. We both love singing along to the same songs in the car and he enjoys watching some of the old movies I enjoyed as a kid. My family is my heart, and because of these two, my passion for life is that much stronger. I love you Ashley and Jaxson. Continuing with the theme of love, be sure to read this month’s cover story (page 4) about Susan Evans and Freeman Simmons who became friends while on a senior center day trip and then fell in love. 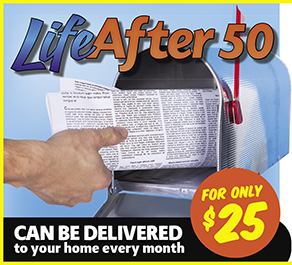 Thank you, as always, for reading Life After 50.